Voices from the Edge is a project that has emerged from a joint initiative between Inclusive Church and St Martin in the Fields. 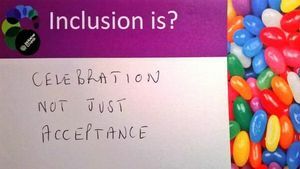 Since 2012 these partners have organised an annual disability conference which is distinctive in that they are ‘organised by and for people with lived experience of disability’. The conferences have drawn together over 200 people, for whom the conference is a vital annual event. Voices from the Edge celebrate 5 years of these conferences with reflections and stories from many of those who have contributed to the conferences. 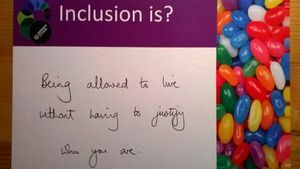 Each conference has had a number of contributors from people of lived experience with disability from a number of Christian denominations, as well as those who are excluded from being part of church because of their disability. The project will celebrate the lives of these individuals. The Voices from the Ede booklet, which will also be available on line as a free download, will allow churches and individuals to learn something of what it is like to be disabled whilst trying to be part of a faith community. It will provide an opportunity for individuals and churches to learn about an example of good practice, based around the model of organising a series of events ‘by and for the people with lived experience of disability’.